Can you see the white X at 50 yards with your naked eye? I'm not asking if you can identify it as a an "X", but can you see a tiny white something at that distance? no, even with my prscrip shooting glasses I can see the black good and I know the X is in the middle so no big deal. yes... but its been getting worse. No, I'm lucky to see a bullet hole. No "X" for me, I see the black circle pretty well with (the top half of) my prescription glasses which are variable focus in the lower half. Lately I had noticed that I was having a very hard time seeing the front sight. While waiting for the corn planter to make another lap I (reading without glasses which has been 'the norm' for 50 years)) noticed the truck dash was in focus and having a 1911 on hand confirmed that without correction the front sight was clear and sharp. 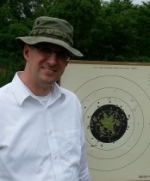 Thinking that I had stumbled on an epiphany, I proceeded to try and shoot wearing just non-prescription sunglasses at the range last week. Sights clear, target blurry, I proceeded to shoot terrible 'patterns' (could not call them groups). Putting the RO away and changing back to the MKII/dot, I was back to my regular mediocre self. I am sure that there is an answer there, perhaps 'lined' bifocals with little to no correction on bottom for the sights and a distance correction above. I used to wear glasses like that for daily use but changed to the variables most specifically to see the dash while driving - I guess things have changed (again). Sorry to hijack your thread. Hoping for some experienced 'incite' for my issue. I wear bifocals also. They are fine for distance and use them with a dot where I focus more on the target and allow the edges of the dot to be "fuzzy." For iron sights I have to tilt my head back too far to use the bifocals so I got a pair made with single vision lenses. The right (my dominate) eye is corrected for 30 inches (my average distance to pistol iron sights and rifle front sights) and the left is for distance. Works well for me, except when scoring when they often get removed. I wear tri-focals all the time now.The middle lens is set up for 30" and I don't have to tip back my head to see iron sights.The bottom is for reading/scoring etc and the top for long distance.I have a cataract forming in my right eye which sorta messes with the whole plan but VA is going to take care of that shortly. I had cataract surgery in April. My far vision is now 20/15 and my near vision is so much better I don't have to use reading glasses most of the time either. I'm shooting with more confidence but I don't know that my scores will change much. He has also had some articles printed in the pages of Shooting Sports USA. *It is actually helpful, if your local doctor is willing, to provide a copy of Dr. Wong's paper to them ahead of your appointment.